please be sure to order early. Prototype: Privately owned locomotive of the Mittelweserbahn (MWB) Railway. 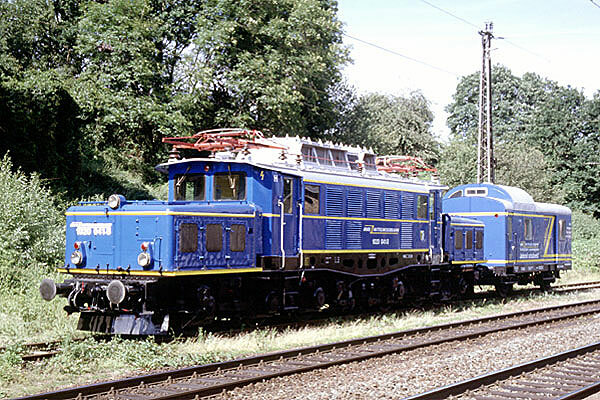 BR (Class) V 121 (Köf II) with closed engineer's cab. Model: Locomotive with digital decoder. Regulated miniature motor. 2 axles driven. With track-level magnets for traction power improvement. Separately applied metal grab rails. Triple headlights and dual red marker (rear) lights change dependent on direction of travel. Lights work in conventional operation and can be digitally controlled. Direct control (starting acceleration/brake delay) with control unit or Marklin Systems. Locomotive in special paint scheme for the private locomotive organization of the central Weser Railway. Length over buffers 7.4 cm. Switching Prehistoric Rock on the Mittelweser Railroad - At one time the equally unassuming as well as lovable class Köf II small diesel locomotives were in wide use as switch engines and were a common sight at most of the German transfer yards. A total of over 1,600 of these units were placed into service from 1934 to 1965. Many of these almost indestructible small locomotives are still faithfully providing service today on numerous privately owned railroads and industrial railroads. The maximum speed for these small locomotives was 30 to 45 km/h / 19 to 28 mph, depending on the design. The most powerful versions were equipped with a 6-cylinder diesel motor with 128 horsepower. 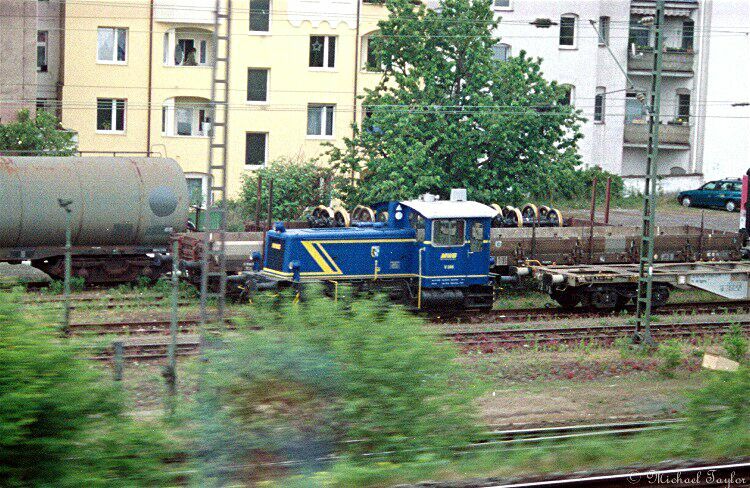 The privately owned Mittelweser Railroad also has a Köf II on its roster designated as the V 121. Prototype: BR (Class) 1020 (formerly E 94 / 194) of the Mittelweserbahn (MWB) Railway. Model: With "mfx" decoder and regulated high-efficiency motor. 3 axles driven. 4 tires. Articulated chassis. Separately applied hand rails. Headlights and tail lights change dependent on direction of travel. Lights work in conventional operation and can be digitally controlled. Lights, sound effect (horn) as well as direct control (starting acceleration/brake delay) with digital controller or Marklin Systems. Length over buffers 21.0 cm. Reconditioned with a New Purpose – The German State Railroad Company placed the heavy class E 94 six-axle articulated electric locomotive into service mainly for difficult operations on steep grades on the Geislingen Grade, which was electrified in 1933. These units quickly proved to be an extraordinarily lucky throw of the dice. They were soon used in many areas of Germany. 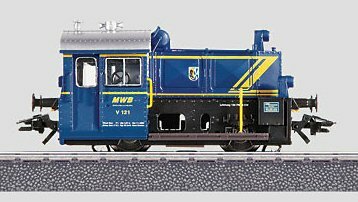 During their long years in service these 120 metric ton heavy motive power units turned in the best results on steep grades and in heavy freight train service. However, the E 94 locomotives were not just used in Germany; many of them found their way to Austria too. There, several of these carefully maintained heavy locomotives survived the waves of retirements longer than their siblings in Germany. In 1996/97 the Austrian Federal Railways (ÖBB) sold the class 1020 units that were now out of service to buyers from abroad. It was in this fashion that the former ÖBB 1020 041-8 now in service on the Mittelweser Railroad first went to Luxembourg. In 1999 it was acquired by the "Eisenbahn- und Sonderwagenbetriebsgesellschaft" / "Railroad and Special Car Operating Company" in Augsburg (ESG) and was used for special nostalgia excursions. 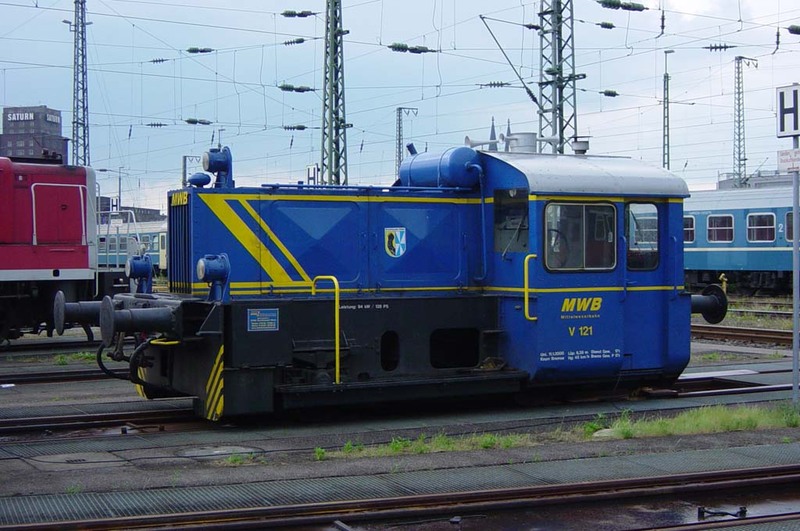 Since 2004, this locomotive has been on the lease locomotive roster for the Mittelweser Railroad (MWB). This privately owned railroad company uses this locomotive, which has been completely overhauled and equipped with modern engineer's cab controls, in heavy main line service, in Cargo traffic and for pusher service. This completely reconditioned also shines externally with its attractive gentian blue MWB paint scheme. Prototype: Flat car typeattung X 05 with brakeman's cab of the German Federal Railway (DB). Piggyback with "Junior" - At the end of the Fifties the Porsche tractors "P 111", "P 122", and "P 133" were renamed the "Junior", "Standard", and "Super". These designations quickly became fixed in the minds of the rural population, and even today, long after Porsche ended its production of diesel tractors, you can still hear people refer to them occasionally by these names.